A book with Susannes best advice and tips. *Description from Forma Publishing:All you need to know about your cat!Does your cat claw up the sofa or urinate in the wrong place? Perhaps it’s trying to tell you something, but what does it mean?In this book, you get the answers to your questions about your cat’s behavior and needs. It includes the “13 holy points” which outline what your cat needs to do during a 24 hour period in order to thrive. Thus you can get the most out of your relationship with your cat.One chapter of the book addresses common questions and answers about cat problems that can arise. Here you get to know why Felix the cat does his business on the expensive carpet in the hall and why Sonja the cat gives away her kittens to the neighbors. 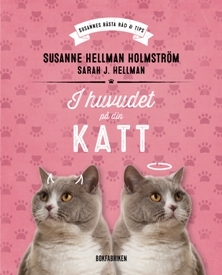 Author Susanne Hellman Holmström is Sweden’s first cat behavior advisor. She has over 30 years experience with cats and breeding. Here she tells about different problem cats, how the problems were expressed, and how they were resolved. Susanne’s personable and engaging style of writing will give you a lot of a-ha moments and laughs along the way. One thing’s for sure: you will see your cat in a different light and maybe even apologize for not having understood it before. That’s why kitty does what it does! This is a real gem of a book! Besides having over 30 years experience with cats, the author also has the ability to convey her experiences in an inviting and charming way, at times tragic and at times humorous. Here you can learn what it means when the cat scratches over its food dish, urinates in the “wrong” place and much, much more. 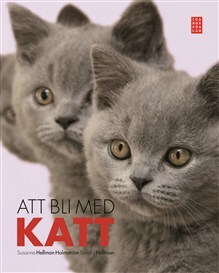 That the book is also full of wonderful pictures of British Shorthairs is an extra bonus for those who love the breed. The recognition factor is high when one looks through the book because here are cats that are found in the pedigrees of many or our Brits. As the number of people who have indoor cats increases, so increases the need for behavioral advice. SHH is the first in Sweden to make house calls to homes where the cats are acting up. In her new book, she writes about some of the cats she has met during these visits and also about her experiences with cats’ behavior and requirements. When it comes to requirements, she lists 13 holy points (such as hunting, play, sleep, and marking territory) and describes in depth what a cat needs to thrive. Susanne writes personably and concretely and gives many practical tips. Paje Holmström’s beautiful pictures and the airy layout make the book easy to read. The book should also be useful as a handbook to which cat owners can return to reread when they wonder about some aspect of cat behavior. 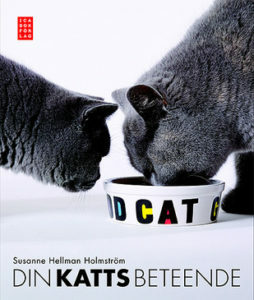 This book will fill a void for Swedish cat owners, and hopefully Susanne will be joined by others who help cats with problems. Rating: 4 cat heads = very good! The book contains a lot of good information for prospective or new cat owners, but it can also serve as a good reminder for experienced cat owners. I read the book all the way through in one sitting and discovered a lot of good tips and some things to think about. Susanne points out that we are always trying to fit the cat into our lifestyle and sometimes forget what the cat needs to feel comfortable and happy. I recommend this book to everyone who has a cat, and to you who are breeders, I strongly recommend that you give a copy of this book to everyone who buys a kitten. We were on vacation with Maud Dickson, and she had your book with her. After having read it, I feel that I want to put a copy in the hands of all who buy my kittens. It is, in other words, fantastic! It describes the cat as a species in a superb way, and thus it increases peoples’ understanding of these wonderful creatures. Good job, my friend! The whole book is permeated with respect for our four-legged friends which has been lacking from some other sources. Even I got a lot of new ideas from your book, so EVERYONE will really find it useful. The book reached third place on Bonnier Book Club’s best seller list for non-fiction in 2009! It reached seventh place on Stora Romanklubben’s (The Big Novel Club’s) best seller list for non-fiction in December of 2009.